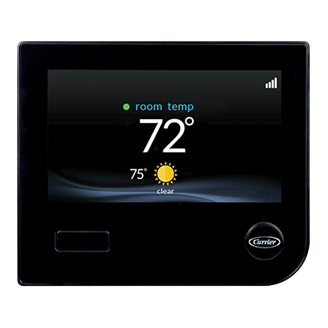 With its sleek, intuitive, smartphone-like touchscreen and remote accessibility, the Côr thermostat makes it easy to change temperatures and maintain control of your home's energy efficiency with the touch of a finger. The engineers at Carrier have developed a thermostat with intelligent controls designed to be the heart of a smarter home–a home where comfort and energy savings go hand-in-hand. The Côr thermostat monitors your energy usage patterns and turns them into simple, actionable energy reports. Available on your desktop or tablet, these reports offer multiple levels of pinpointed data about your system and home's performance. Whether you want a high-level overview or minute-by-minute data, the Côr thermostat offers the right energy report to help you make smarter decisions about how you control your home's comfort. From here, you can control your comfort as you would on the wall or via your smartphone. Change the temperature manually or use the Touch-N-Go® feature to make temporary adjustments with a click or a tap of the finger. You can also glance at the current weather, view your monthly savings and get easy access to your expert Carrier® contractor's contact information along with shortcuts to other helpful features. To further understand your monthly savings, just click or tap on the Côr™ Energy Report tile. Energy reports from the Côr thermostat - available on your desktop or tablet - offer pinpointed data about your system's performance, allowing you to make smarter decisions about how you control your home's comfort. 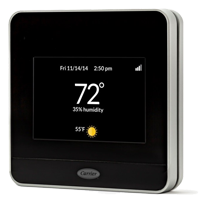 Choose which smart features you want the Côr™ thermostat to use to help keep you comfortable and take the guesswork out of saving money on your heating and cooling energy costs.